Jon has been busy carving recently so has needed to do lots of this! First he soaks the Japanese whetstones in water. 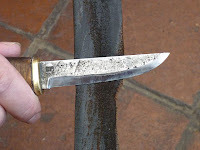 Using the rougher side first, he sweeps the blade 10 strokes up and 10 strokes down, and then 10 strokes alternate. 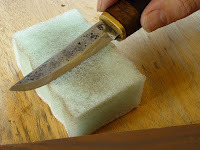 Then he wipes the blade to remove the larger particles from the bevel. 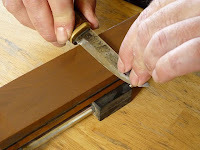 He repeats the sharpening process using the finer side of the whetstone until he is happy that the knife is sharp. 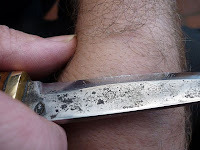 Then he wipes the blade again before stropping. 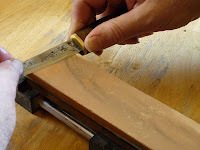 He strops to break the very fine foil edge off the blade that has formed during the sharpening process. 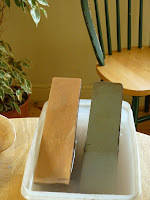 He uses a leather strop - an old leather belt. ...and he can return to his carving work. Gosh that is one VERY sharp knife!! Hi J.P How's it going ?